Packing a healthy school lunch for your kids is quick and easy with these five kid- and mom-approved ideas (plus 40+ recipes to put them into action)! Everyone knows what the month of August is well-known for: back to school season (and brutally hot temperatures, at least here in NY!). But did you know that August is also Kids Eat Right Month?! Coincidence or not, I can’t think of a better time to focus on healthy practices for feeding children than the start of a new school year. After all, the summer months are often filled with extra special treats like ice pops and ice cream, more weekend gatherings like barbecues that are food-focused, and less structure to the day than during the school year. As a mom, I look at back to school season sort of like how adults look at the New Year as a time to refocus and get back on track after weeks of holiday celebrations and parties filled with too much wine and food! To get parents ready for getting the kids back to healthy eating habits for the school year and in honor of Kids Eat Right Month, I’m sharing with you 5 Quick, Easy, and Healthy School Lunch Ideas and some ways to put them into action. 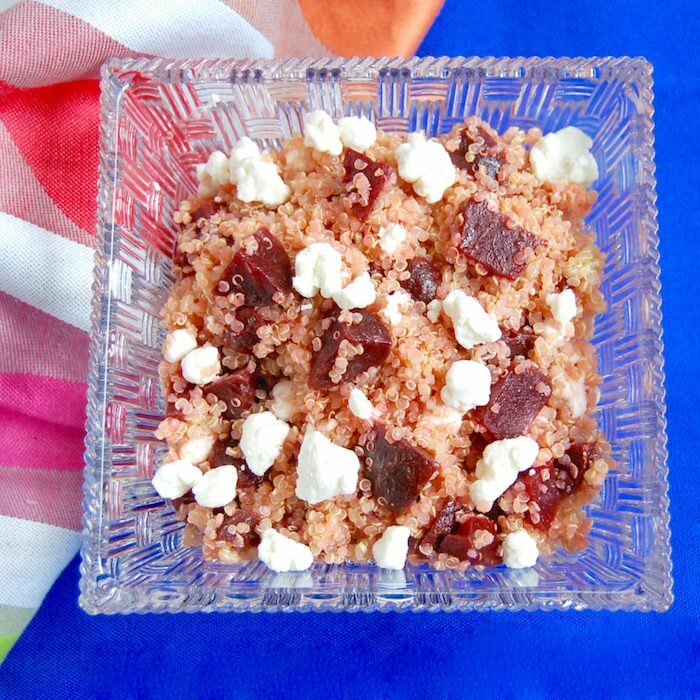 As I mentioned the other day, this is the first year I have to send a brown bag lunch to school for my girls, but all of these lunch ideas are ones my girls have eaten for lunch at home, so I know they are kid-approved, and obviously since I am recommending them, they are mom-approved too! 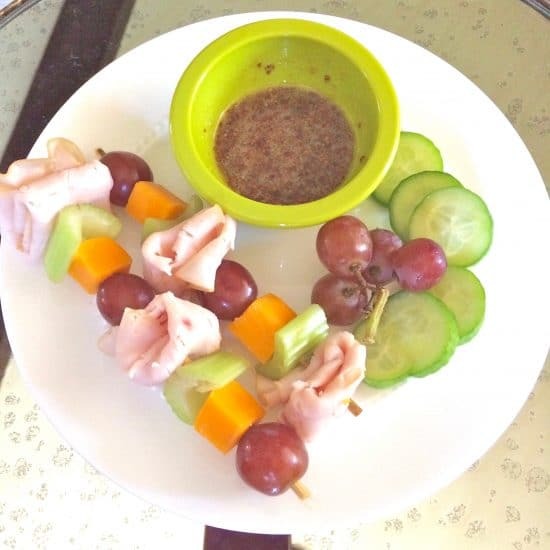 Peanut Butter and Fresh Fruit Sandwich Skewers or if your child’s school is nut-free, use soy butter or SunButter; I also like to use fresh fruit in place of jelly! For more ideas, check out this great post, 50+ Ideas for Lunch On a Stick. 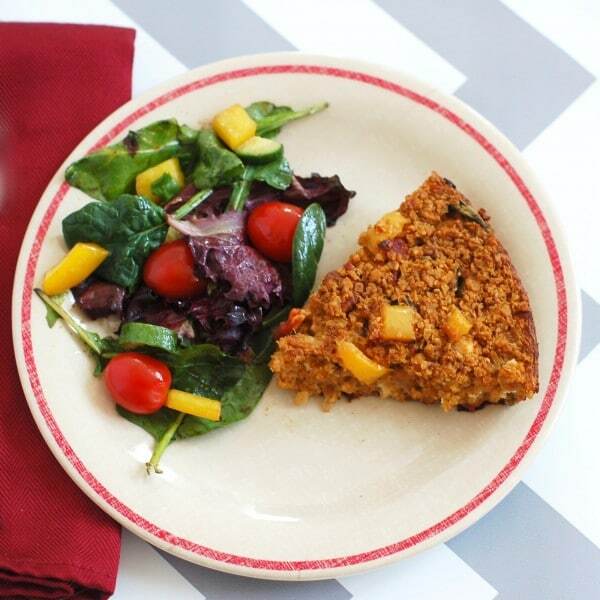 Get more muffin-tin meal ideas from my friend and fellow mom dietitian Katie at Mom’s Kitchen Handbook! My kids love sandwiches, but I’m not crazy about them having a sandwich for lunch everyday. I’m definitely not anti-carbs or bread (I could never live without bread! ), but kids tend to get an abundance of carbs throughout the day and if I want to make pasta or another carb-heavy dinner I want to make sure they’re not overdoing it on that portion of their diet. Easy Egg Wraps – fill with cheese, avocado, veggies, or whatever else your kids will like! If that’s not enough ideas for you, be sure to check out my Guide to Back to School Meal Planning too! Remember, when packing your children’s lunchbox, provide a variety of food for a balanced plate – even if the meal is not being served on a plate at all! Marina over at Nutrichicos has a great post that shows you just how to pack a balanced lunchbox and check out my Top 5 Tips For Packing a Healthy & Delicious School Lunch. And in the spirit of Kids Eat Right month, here’s a video of my girls making smoothies with me the other day. You may have seen it when I posted my first insta story on Instagram, but here it is in full! Don’t forget to get your kids in the kitchen to help you menu plan, cook, and pack their lunchboxes – their involvement goes a long way to helping them try new foods and eat a healthier diet! What’s your favorite healthy school lunch to pack for the kids? What’s their favorite lunch to eat? These are great tips and you’re right about those skewers!!! My daughter thinks they’re pretty amazing. Thanks so much for a great post Jessica! Thanks Sara! So glad to hear your daughter likes skewers too! I mean I love ’em, so I totally get that kids do! Thanks Cara! I love grain salads also. I use all these ideas for myself too! So many great ideas! Those lunch kabobs are so stinkin’ cute! Thanks so much Laura! Gotta make the food fun and cute for the kiddos! Thanks EA! I know I’ll be making batch after batch of those egg muffins of yours! Hope your daughter likes the skewers! I love them too! I want these in my lunch! I think it’s safe to say, I need to start packing my lunch like the kids, maybe that will keep me from mindless munching too! Love the videos the girls are doing! Keep it up! Haha…me too! I often say I should only put as much time and thought into my lunch as I do the kids! Thanks for the video encouragement. I’m slowly getting there! Lunch kebabs…such a great idea and so cute. I’m going to show this post to my kids and see what they want to add to the rotation. Thanks so much Katie! Would love to know what they pick! You are super mom! I am pretty sure I’ll be sticking to boring old PB&J for a while until we get our routine down! LOL! 🙂 But these are some great ideas when I need inspiration! I’m not a mom, but I totally need all the quick easy little bite lunch ideas I can because it feels like the day is always moving so fast! Oh, I totally hear you. And the great thing about these lunch ideas is that they’re not typical “kid food” so they are perfect for adults and kids alike! I love all of these! I might have to try them all myself! Love trying new thing for lunch! I have no doubt you will love them just as much as your little guy Kristina! Super collection of recipes and ideas! I think that many of these would be also suitable for busy on-the-go adults!! I want to try some.. for sure.. The muffin tin ideas are always a favourite in my home! Thank you! Thanks so much Carol. Definitely good for adults too, and I’m with you – muffin tin meals are always fun! Thanks Raia! I sure hope so! What a great way to start off the school year. So many healthy ideas here. I want you to make my lunch! 🙂 Lucky girls. Love all of these healthy lunch ideas! 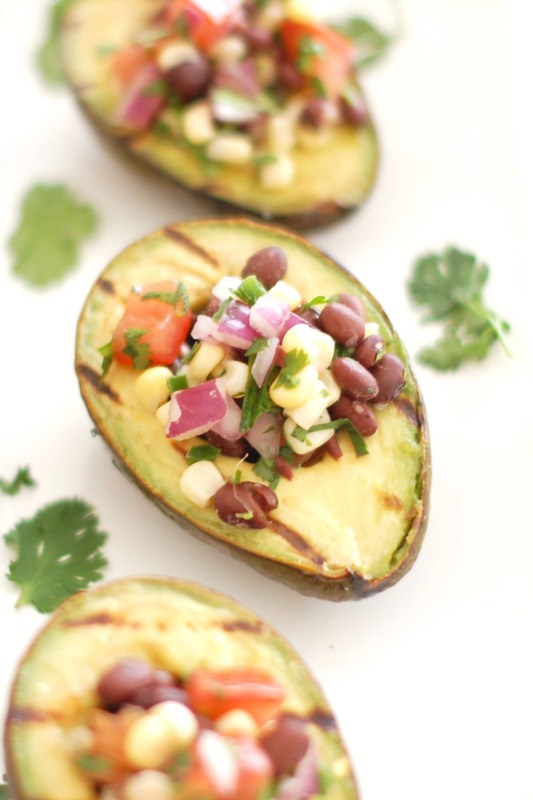 That grilled avocado looks amazing! Thanks Abbey – it’s so good! My girls love them! Thanks Shelby. I LOVE this round up. I need these ideas for fall! Thanks Melissa. Hope they help! Love those kabobs! All of these ideas look amazing! Lunch kebabs are really fun for the kids. Thanks Christine! I LOVE these ideas! Tucking this post away to pull out each week when I meal plan! THANKS! Thanks Kelsey! Hope your family enjoys them! The girls don’t have favorites, well I guess they do but they go in phases. They usually start out the year with a pb&j, this year I see sandwiches maybe being more popular with our homemade sourdough. The end of the year is almost always just smoothies, veggies, and fruits. My oldest loves chia drinks and foods. Hoping to switch things up a little more again this year which shouldn’t be an issue as they’re already requesting prepping things like my oldest wants homemade ravioli since she can’t have it at school and lasagna and those were the only two things she liked going into middle school and that she ate last year. Wow, Sarah! I am so impressed by your daughters’ interest in making their own lunch, especially items that are more work than typical lunches! Hope they have a great -and delicious – school year ahead! I don’t have any kids yet but I do pack my own lunch on occasion! So many tasty ideas here, thank for the inspiration! These are really great for adults and kids alike Whitney. Hope you enjoy some of them! Such a great resource for Mamas! 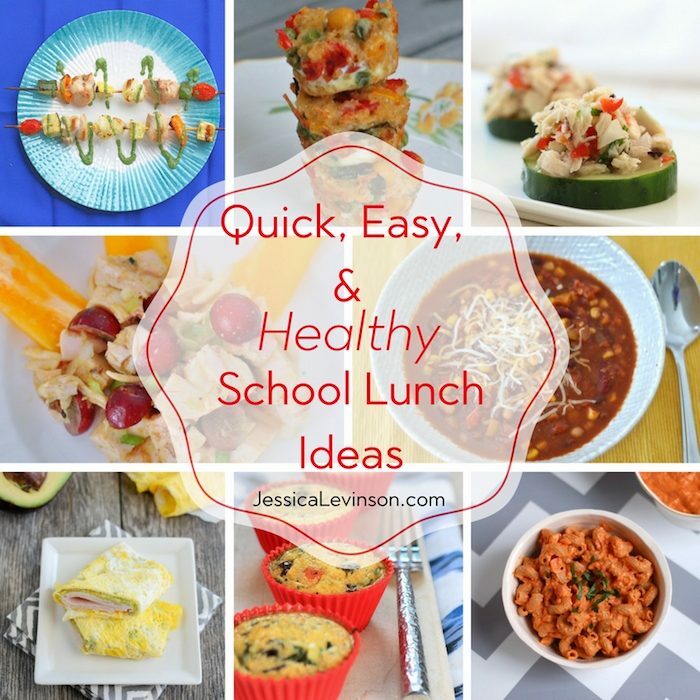 Love all of these great ideas for healthy school lunches. Thanks so much Julie. I hope lots of moms and dads find them useful and a hit with their kids! My favorite lunches are big salads and rice bowls, but I need to get better at making and using leftovers and at prep to simplify it. I’m often whipping them up fresh each day which takes a lot of time! Salads are my go to – with all the fixings. Grain bowls have been a hit with my girls too. Leftovers definitely make it easier! These ideas look AWESOME! I’m always looking for new things to incorporate into my weekly routine. Thanks so much Jordan! Hope you enjoy some of these and they make it into the weekly routine!